The word ‘crisis’ has a wide range of meanings and it’s well used in the media to catch the reader’s attention. Lately, the terms ‘political crisis’, financial ‘crisis’ and ‘constitutional crisis’ appear almost daily in media headlines. In a previous life, the term ‘crisis management’ was used daily in the work I was undertaking as I went from problem to problem, dampening or putting out fires (….. that’s a metaphor!). Thinking back, my adrenaline (epinephrine), norepinephrine, and cortisol must have been very busy! However, in the world of Neuroendocrine Tumours (NETs), ‘crisis’ has a very significant meaning and its very mention will make ears prick up. The word ‘crisis’ is normally spoken or written using the term ‘Carcinoid Crisis’ given this is the type of NET with which it has been mostly associated. However, I’ve studied and researched and it would appear that some form of ‘crisis’ might apply to other types of NETs. Perhaps this is another knock-on effect caused by the historical use of the word ‘Carcinoid’ to incorrectly refer to all NETs. In terms of ‘crisis’, maybe there should be a more generic NETs wide term? Of course there should, once again ‘carcinoid’ is causing confusion. What is (so called) ‘Carcinoid Crisis’? In the simplest of terms, it is a dangerous change in blood pressure, heart rate, and breathing (technical term – cardiopulmonary hemodynamic instability). On an operating table under anaesthetics or an invasive procedure such as liver embolization, this can actually be life threatening. Incidentally, this happens with many other types of conditions (hormones and peptides do exist in other illnesses). However, with a patient already oversecreting these hormones and peptides, it could be a life or death situation. What is the difference between carcinoid crisis and carcinoid syndrome? Carcinoid crisis is said to be a situation where nearly all of the possible symptoms of carcinoid syndrome come at the same time and in some severity. Carcinoid crisis is a serious and life-threatening complication of carcinoid syndrome, and is generally found in people who already have carcinoid syndrome. The crisis may occur suddenly, or it can be associated with stress, a reaction to treatment, but it is mainly as a result of the use of anaesthesia. There is a thin line between a very severe bout of carcinoid syndrome and carcinoid crisis but generally it can be characterized by an abrupt flushing of face and sometimes upper body, usually severe falls in blood pressure and even bronchospasm with wheezing can infrequently occur. The attack may look like a severe allergic reaction. It is said by one very well-known NET expert to “not to be something which happens randomly to all patients, it is usually linked to a medical procedure of some sort when you are having anaesthesia”. Dr Eric Liu also said “Luckily it is relatively uncommon”. Why does it happen to some NET Patients? NETs can release a variety of ‘vasoactive peptides’ (hormones) in excess (e.g. serotonin, catecholamines, histamine). Under normal circumstances, these would just present as routine syndromes which may need to be controlled in most cases with somatostatin analogue treatment (Octreotide/Lanreotide). Excess amounts of these vasoactive substances can cause both hypertension and hypotension (high and low blood pressure respectively). In extreme cases this can lead to what is known as a crisis situation. How is the risk managed? Most people are effectively managed on monthly injections of Octreotide/Lanreotide but some people still need ‘rescue shots’ (top ups) where they are experiencing breakthrough symptoms. When I was symptomatic (syndromic), I would regularly flush in stressful situations but that was definitely syndrome rather than crisis. Check out my video explaining how I felt. It’s worth reading something called the 5 E’s of Carcinoid Syndrome, probably useful to other types of NETs as I’m sure there is some overlap. If you research this plus perhaps from your own experience, you will know there are different ideas and ‘protocols’. However, they all mostly involve some pre-procedure infusion of a somatostatin analogue (normally Octreotide) – although I’d love to hear from anyone who has had Lanreotide as an alternative. 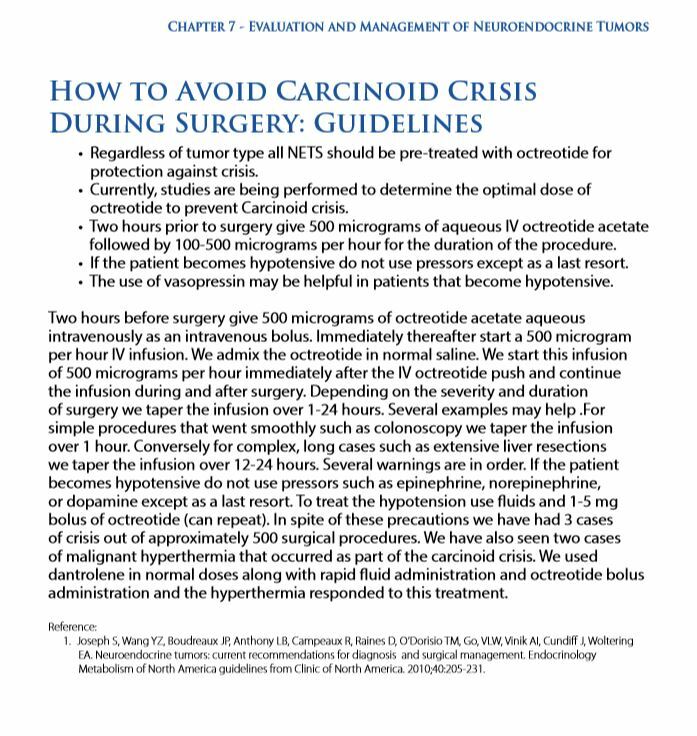 Some doctors or hospitals are known to have their own ‘protocols’ and I’ve uploaded the one from the ISI NET book page 215 (Wang, Boudreaux, O’Dorisio, Vinik, Woltering, et al). Click here. Please note this is an example rather than a recommendation as this is something the NOLA team have developed for their own centre. In all the big procedures I’ve had done in my local NET Centre, I have always been admitted the day before to receive what they describe as an ‘Octreotide Soak’. The link below is an example of the UK standard for pre and peri-operative protection (please note your NET team may be working to a slightly different protocol based on their own version of best practice, just to emphasise that this is an example and not advice). Patients are always asking about the risk and requirements for smaller procedures such as an Endoscopy. There does not seem to common guidance on this but Dr Woltering who is always forthcoming with advice suggests 200 micrograms of Octreotide before the procedure commences. Dental visits involving anaesthetics can also be an issue and you can see Dr Woltering’s advice in my blog about the 5 Es of Carcinoid Syndrome. Additionally there is advice for users of ‘Epi Pens’. You also need to derisk those situations. The ISI Book Link above (here for convenience), does state “regardless of tumor type, all NETs should be pre-treated with Octreotide for protection against crisis“. I know that NET patients other than those with ‘Carcinoid Tumours’ are also treated with somatostatin analogues, as they too can be subject to the effects of excess secretion of certain vasoactive peptides. Why is the issue relative to Pheochromocytoma/Paraganglioma? Pheochromocytomas and paragangliomas are catecholamine-producing neoplasms that can cause life-threatening hemodynamic instability, particularly intraoperatively, when the tumor is manipulated. In some ways their version of ‘crisis’ is more complex and dangerous than in the issues with carcinoid crisis above. There needs to be significant pre-operative preparation in addition to peri-operative measures, in fact with this type of tumour, post surgical treatment and monitoring is also required. I recently read an article about a person with a Pheochromocytoma. The person had what was described as an ‘Intraoperative Hypertensive Crisis‘ that appeared to be caused by her tumour type rather than the sort of incident that might occur in a standard surgery. Hypertension (high blood pressure) can be a symptom of Pheochromocytoma so you can see the problem with surgery and other procedures. An interesting issue with this type of NET is that after surgery, the patient is at risk for hypotension (low blood pressure) from venous dilation caused by the sudden withdrawal of catecholamines. Read more here. I highly suspect there are many examples from the NET world beyond the ‘carcinoid’ subtype of NETs and I’ve already given you one above. I’ll update this blog as I discover other examples. In the meantime, make sure you ask your medical team about ‘crisis protection’ if you are to undergo any surgical or invasive medical procedure. Minor procedures should also be assessed. Do we need to rename the term Carcinoid Crisis to Neuroendocrine Crisis? Probably …… let’s give it a red card!